Just over a year ago, the Bardini Museum in Florence opened to the public again after long and accurate restoration work aimed at re-establishing the configuration that its founder, the antiquarian Stefano Bardini, had originally given the exhibition. Bardini trained as a painter and became famous as a restorer and art dealer. 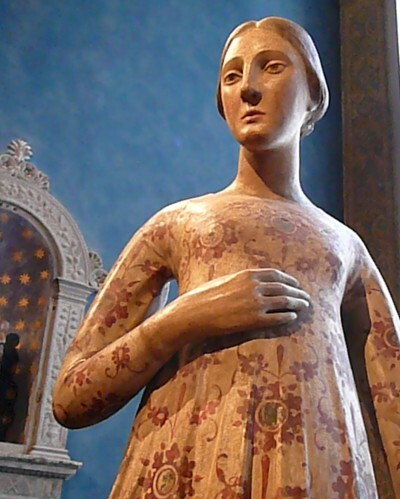 He created a collection of artwork with a deep passion for the Renaissance and skill at unearthing medieval Florence. All can now enjoy this distinctive museum, which was actually the antiques showroom where Bardini sold thousands of pieces that now grace the galleries of museums as well as private collections throughout the world. Bardini’s blue walls have been restored from the ochre preferred by some early 20th century conservator. On account of its uniqueness, many, including Jacquemart-Andrè in Paris and Isabella Stewart Gardner at Fenway Court in Boston, imitated the blue color employed by Bardini. In fact, Mrs. Gardner worked hard to get the exact color of blue to show off her marble sculptures in the same way Bardini knew it would highlight the creamy white of those pieces he had for sale. See her correspondence with Renaissance art expert, Bernard Berenson, on the subject. In 1881, Bardini acquired the deconsecrated church and convent of San Gregorio facing piazza dei Mozzi in the Oltrarnoand. He set about transforming it into his opulent residence, restoration studio and showroom. Bardini donated the palazzo to the Municipal Administration of Florence in 1922 as a museum. The building is remarkable for its use of doors, windows and moldings of old fragments originally belonging to ruined churches and villas. The ceilings are magnificent examples of Venetian glass and Tuscan woodwork ranging from the 15th to the 17th centuries. The collection comprises sculptures, paintings, furniture pieces, ceramic pieces, tapestries, as well as fragments of the old center of Florence, salvaged before its destruction in the 1860s to make way for the new national government buildings. These items are displayed on the ground and the first floors according to a layout that fully reflects the character of a typically private collection. 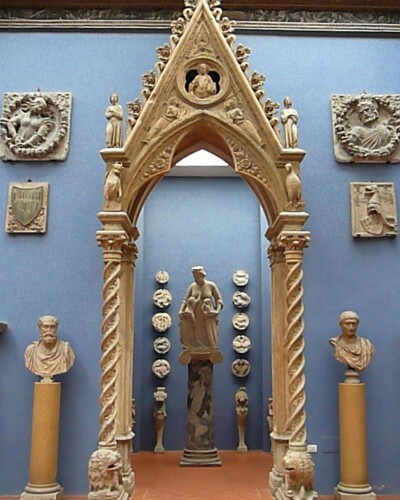 In addition to Roman sarcophagi, capitals, Roman and Gothic relief work, there are also other remarkable examples like the work of the Della Robbia brothers (15th and 16th century), works attributed to Donatello and to Nino or Giovanni Pisano, in addition to the famous “Charity” by Tino di Camaino (1280 app.-1337). 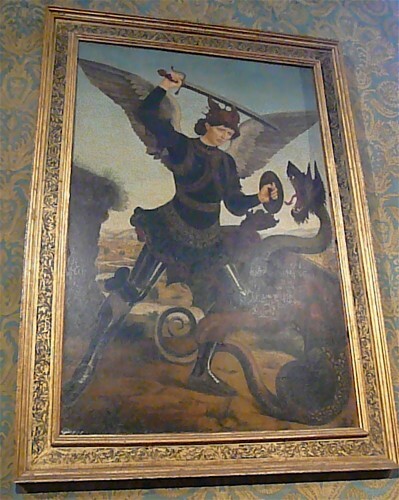 The most outstanding painting of the collection is perhaps St. Michael Archangel by Antonio Del Pollaiolo (1431-1498), although there are many other precious works among the collections of weapons, 15th century polychrome stuccoes and wooden sculpture. 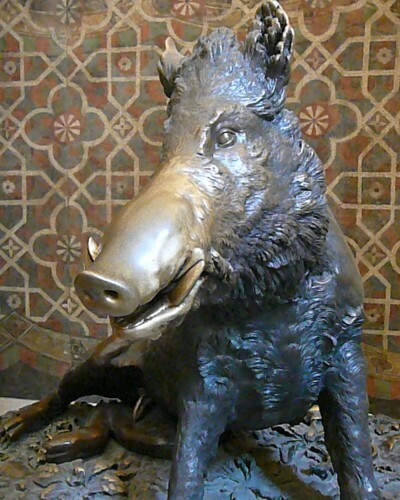 The original of the famed bronze of the wild boar, Il Porcellino, (Pietro Tacca, 1612) a copy of which draws crowds in the Mercato Nuovo, sits bored in a small alcove of its own. The museum is rarely visited by tour groups, making it the perfect place to visit on a hot summer day in Florence. It is only open three days a week – Saturday, Sunday and Monday from 11am to 5pm. It’s easy to get when you arrive. Check for the office at Door # 2 at the Uffizi Gallery.